As mentioned elsewhere, I don't worry about mixing rock types during coarse grinding. 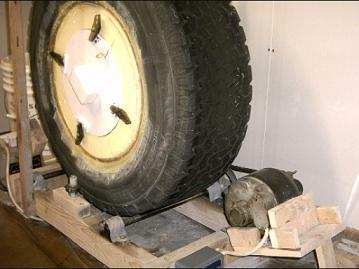 Everything goes in my big tumbler with the 31-inch tire for a barrel. You can read the (original) technical documentation here. One photo nearby shows the revised door design (as of November 2003), including a screw-eye I added to the edge of the door after drawing up the revised design (grin) to make it easier to pull it off the "slurry glue" when opening it. This picture shows what it looks like when the door seal or the rim seal leaks a little! Also note the supports I had to add after all to keep the tire upright. You can't see the rollerskate and rollerblade wheels between the supports and the tire. Another photo nearby is a side view. A third photo nearby, taken without a flash, shows the tumbler in motion. Size: 31x10.5x15 tire = 31 inch diameter, 10.5 inch width, 15 inch diameter rim (fairly common size, but old style measurement). Speed: 1 revolution in 6.3 seconds => ~9.5 RPM => 0.87 MPH => 21 miles/day. Mileage: If a tire lasts 6 months, that's ~3800 miles before the inside wears out. Electricity: ~204 watts => 4.9 KWH/day => ~34 cents/day for electricity used for coarse grinding only (usually 30 grit). Capacity: Loaded with 2 gallons of rocks, 1 gallon of water, 2 cups of coarse SiC (silicon carbide) grit => ~3 lbs or $4.50 => $1.12/day. Cost: Total < $1.50/day 4 days per load, typically results in 1 gallon of rocks ready to polish => ~$6/gallon (or ~12-15 pounds). Coarse-ground stones then move to smaller tumblers for fine grit (220), pre-polish, and polish; one week per cycle, yielding 1 gallon (12-15 pounds) of polished stones every ~3 weeks. Hockey pucks: Two, screwed to the inside wall from the outside (between tread grooves); $1 or so each. These increase tumbling action. Slurry in a hurry: ~4 gallons of mostly-dehydrated mud per month.